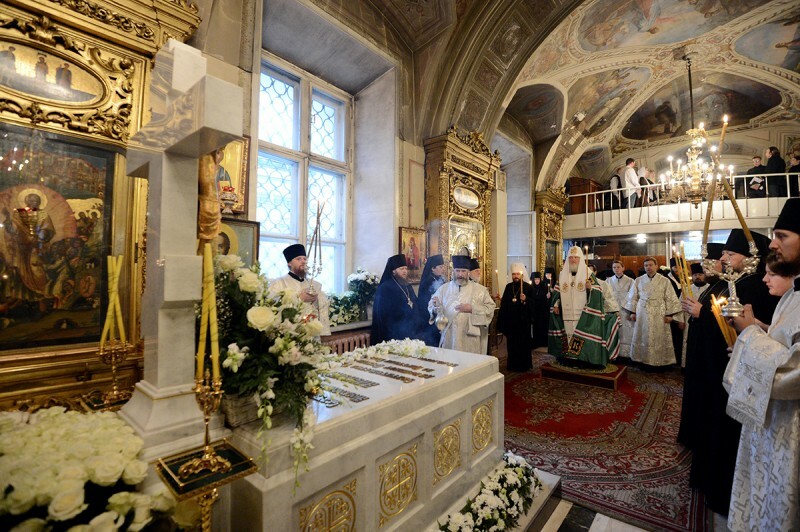 On December 5, 2012, the 4th anniversary of the demise of His Holiness Patriarch Alexy II, His Holiness Patriarch Kirill of Moscow and All Russia said the Office for the Dead at the grave of the 15th Primate of the Russian Church at the side-chapel of the Annunciation in the Cathedral of the Epiphany in Moscow. The service was attended by numerous high church officials, bishops and priests including the Moscow clergy as well as abbesses of Moscow convents. ‘Today we commemorate the 4th anniversary of the blissful demise of His Holiness Alexy II, Patriarch of Moscow and All Russia. ‘Years are flying fast, and we are now separated from that event by an enormous layer of time filled with new problems, complexities and emotions. The clearer the circumstances of time the deeper one understands that every era has its own sorrows, difficulties and experiences. If we speak of the history of the Church, all that matters for her has to do with her Primate, the Patriarch. And we know how close His Holiness Alexy II took to heart our people’s joys and sorrows, joys and hardships our Church went through. ‘The Lord ordained him to become the Primate at a time when the Church was delivering herself from the 70 year-long captivity, when the Church was becoming free, when new opportunities appeared for the Church to organize her own life and to interact with the world around her. It was a time of fateful decisions which laid down a certain tradition for years ahead. ‘We remember His Holiness Alexy at such epoch-making moments as the consecration of the Church of Christ the Saviour, the consecration of the Church of Our Lady of Kazan in Red Square, the bringing of the Icon of Our lady of Tikhvin to Moscow. One can enumerate many events linked with the revival of monasteries’ life – our marvellous historical cloisters, the appearance of new churches and new monasteries. Therefore, we pray to the Lord that He may give rest to the soul of His deceased servant, the ever-memorable Patriarch Alexy, with gratitude for all the deeds he performed and for all the deeds our Church performed under his guidance. May the memory of His Holiness Patriarch Alexy be cherished in our hearts. May this memory be always accompanied with a prayerful appeal to the Lord that He may receive the soul of His servant in His heavenly Kingdom and make the memory of His Holiness eternal in our hearts. Amen’.